The leaders of the Mississippi Republican party say they are not planning to slow down in the 2014 legislative session. MPB's Jeffrey Hess reports the Governor, Lt. Governor and Speaker of the House all believe they can build on a string of conservative legislative successes. All three men spoke at a political event in Jackson yesterday and listed a series of what they considered their political successes such as cutting taxes, expanding the charter school law, and limiting state spending. Speaker of the House Phillip Gunn says Republicans remain united heading into their third year in control of both chambers of the legislature. "I would say that I think we have built a great team at the capitol over the past two years. The things we have passed, the things we have accomplished establish the fact that we are moving in the right direction. I think most Mississippians agree with that," Gunn said. Governor Phil Bryant agrees that Republicans are on the same page and predicted that public safety will be the corner stone of the session which begins in January. Republicans have ticked off many of the major goals they campaigned on in 2011 but Lt. Governor Tate Reeves says issues still remain. "There will be a lot of bills that have passed the senate that we haven't been able to get through the house and I think vise-versa. But things like appointed school superintendents. 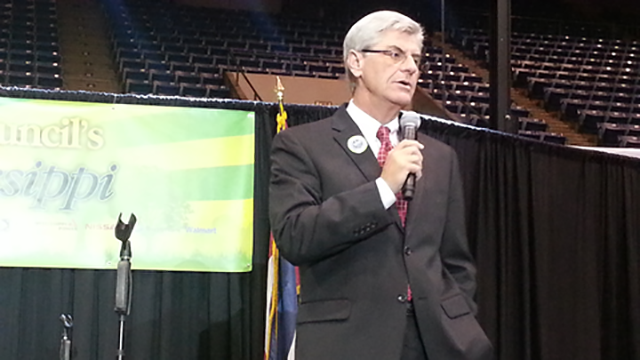 There are 150 elected school superintendents in the country and almost half of them live in Mississippi," Reeves said. But Legislative Black Caucus chairman Senator Kenny Wayne Jones of Canton thinks he is seeing division in the G-O-P, as evidenced by the formation of a Senate Conservative Caucus and a primary challenger to Senator Thad Cochran. Jones says that could provide the democrats an opening to push their top legislative goal...Medicaid expansion. "Depending on what areas they come from, there might be two or three that feel differently about the stance they took before. And it might be three more but we are looking forward to that happening if it is going to happen," Jones said. Republicans blocked efforts to expand the Medicaid program last year, and would likely continue their resistance in the next session saying the expansion would be too expensive.